In the not too distant past, it wasn’t unusual to find a PR executive armed with a ruler and a pile of magazines, literally measuring coverage in terms of column inches. The size and space would then be used to measure what an advert of an equivalent size would have cost, based on rate card prices. While PR evaluation methods have moved on somewhat since then, the use of Advertising Value Equivalent (AVE) remains a popular method of measuring coverage. Love it or hate it, the case for using AVE is a strong one: Telling a client that you have secured coverage worth £25,000 on a budget of £1,000 makes the PR company look good; presenting the same figures to a board of directors makes the client look good. In today’s tough economic climate, and despite falling advertising costs, the ability to present a clear indication of return on investment is vital. It offers a definite measurement, with a tangible figure attached, that can be clearly understood within the PR industry and beyond. Finance directors controlling the purse strings may not be familiar with the ins and outs of PR campaign planning; they do, however, understand figures that demonstrate that a spend was worth it. Yet AVE is becoming more maligned within the PR industry as many feel it does not show the true value of PR coverage. In 2010, a group of industry experts met in Barcelona to try to thrash out a more acceptable way to measure campaign outcomes. These aptly named Barcelona Principles, updated three years ago, are now considered a universal standard of measurement, placing greater emphasis on outcome rather than output. The principles begin with setting goals, then checking results according to whether these were achieved. If these goals equate with business results, it becomes easier to define the value of success, so you can analyse what works and what doesn’t and alter your strategy accordingly. ‘Traditional’ PR campaigns, however, are notoriously difficult to evaluate in precise terms. The number of readers a feature in a magazine may attract is always going to be an estimate, as is exactly how the brand is portrayed and whether or not the message was clear. Digital methods are somewhat easier to assess. Social media, for instance, is now an accepted form of PR communication, therefore Twitter and Facebook’s built-in analytics make assessing reach and engagement a relatively painless task, while SEO and click-through will also be affected by digital PR – another tactic that can be measured in facts and figures. Technology is available that claims to generate data-rich coverage reports to demonstrate campaign effectiveness in minutes by simply filling in links. In fact, there are countless tools on the market that can supposedly help PR professionals, from finding journalists or bloggers to apps that claim to help you write better headlines. 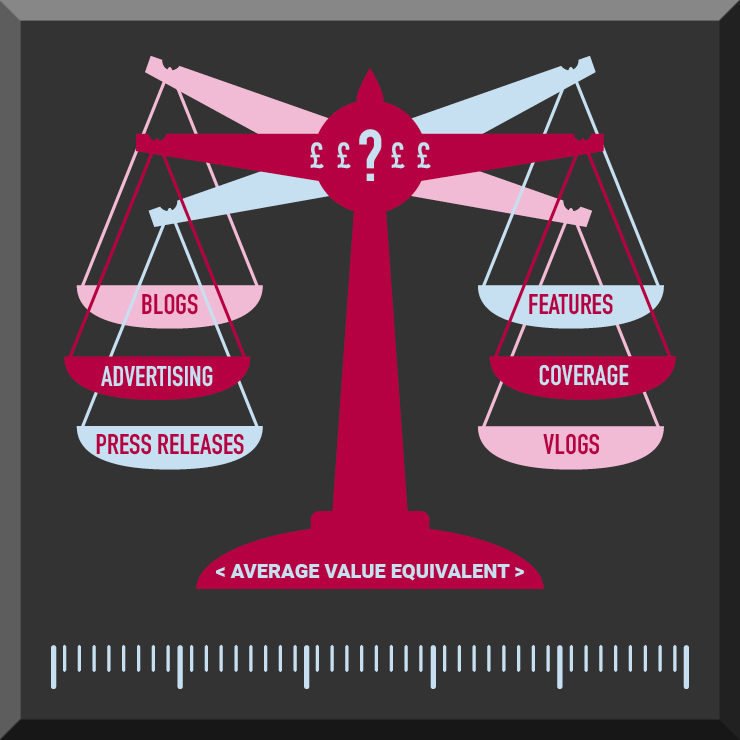 Type ‘AVE in PR measurement’ into Google and a wealth of blogs will appear, some of which are little more than a thinly veiled attempt to market such innovations. In an ideal world, ROI would be directly linked to the outcomes a campaign generates, with the objectives set out clearly then tied in closely to organisational objectives. Which is all very well, but no two campaigns will be the same; therefore, no two sets of objectives and consequently measurement methods will be the same either. On this basis, the average modest sized B2B agency with multiple clients could cheerfully spend the best part of the working week analysing the value of each campaign and measuring outcomes, only to present your figures in a way that mean little to your average MD. AVE may be flawed; however, a recent survey by PR Week found that more than 35% of UK PR agencies still use it as a method of measurement, largely because clients like and expect it. Our customers understand and like AVE, and while the demand exists for easily measurable figures, AVE will live on. • What do you think? Are AVE’s days numbered or is it still a relevant and useful means of evaluation?